"Are there magnetic bookmarks with elephants on them this year?" asked several customers at the Leipzig Book Fair. With a suggestive look at my husband Klaus, I replied that so far nobody wanted to go on safari with me in Africa. "Then just paint the elephants in the zoo. You come from Berlin," a customer suggested. The elephants I last saw in their small enclosure 20 years ago? "No, not the ones in the zoo. They look so sad," I replied. The book fair came to an end, the idea lingered – and became a plan. There are elephants in Sri Lanka, too. And that's where the journey with Klaus and Xira, our daughter, went the next winter. At the top of the list of our destinations were all the places where you could meet elephants. In Udawalawe National Park we discovered large groups of wild elephants. Sitting in a lurching jeep I painted, as best I could, the mighty back of a young bull. He and his buddy enjoyed crossing our sand roads again and again. Later we visited the elephant orphanage Pinnawale west of Kandy. Here I found several motifs: an old congenial elephant with almost crossed tusks, bathing elephants in the river and a young female elephant who relaxed lying in the water while her skin was scrubbed with a broom. 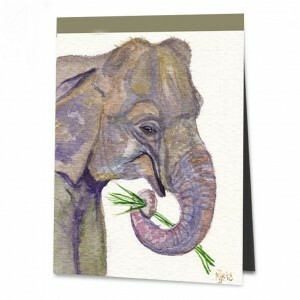 And finally, I painted the cheeky little male elephant, who had a real sense of humour. The painting emerged after bathing during feeding time: tied next to each other, the elephants stood in a shelter. In front of each of them lay a bundle of juicy palm fronds, all of them munched contentedly – except for a small elephant. He stretched himself out and flattened himself by shifting his body backwards and almost sitting on his backside. His head was almost at leg height as he slowly and carefully swung his straight trunk to the side, bent it to a snail in front, and stole a palm frond stick from his neighbour’s nose. The little elephant's eyes flashed with pleasure at his successful prank – and we, as observers, also enjoyed ourselves. "Oh, you finally have elephants," the elephant lovers were delighted at the following Leipzig Book Fair. But one customer was obviously disappointed. "Couldn't you have painted a happy elephant? One who puts his head back and rolls his trunk up." She had once seen one on a river in Botswana. "A pity," I regretted, "but we never met a really happy elephant anywhere in Sri Lanka. But look, at least a little cheerful one!"